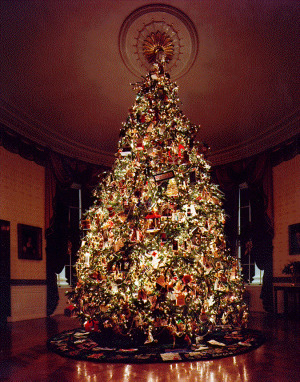 Possibly the most well known symbol for Christmas – that has delighted families and friends for hundreds of years while at the same time frustrated superintendents, cleaning staff, and environmentalists to the same degree is the Christmas tree. A significant issue that has arisen with the use of Christmas trees relates to what multi-faith families can or should do. This idea came as a result of speaking with one of my clients who converted from Christianity to another religion who, although content with her choice and new religion, misses celebrating with a Christmas tree. Further, she wants her young son to experience all of the fun that can be had with decorating the tree and the general festivity of decorating, etc. A Gratitude and Wishing Tree! Rather than the some old tree each year, and having it represent Christmas (why should those who are not Christian go without? ), make it a tree upon which your family can hang lights, bulbs, AND words and pictures of people, experiences, achievements, goals, and other material items that they are both grateful for and that they desire in the upcoming year. This by-passes the more religious nature of the tree and makes it fun for ALL people of ALL faiths and religions (even those with no religious affiliation). In my eyes Christmas and Hanukah are primarily about gratitude, not unlike Thanksgiving. With this in mind and to foster the experience, why not make it a Gratitude and Wishing Tree!? This also, of course, makes sense to have the gifts beneath it AND it is multi-denominational for all faiths AND children (adults too) who have always wanted to experience what it is like. I would even encourage putting a menorah (Hanukah) on the top and hang dreidels off the pine needles! – just don’t light the menorah or you may have a personal experience similar to Chevy Chase and the Griswold’s in National Lampoon’s Christmas Vacation! If you decide to do this, definitely take a photo of it and send it to me. If you allow it, I will post it and we can view and delight in the many creative Gratitude and Wishing Trees and possibly begin a global trend!